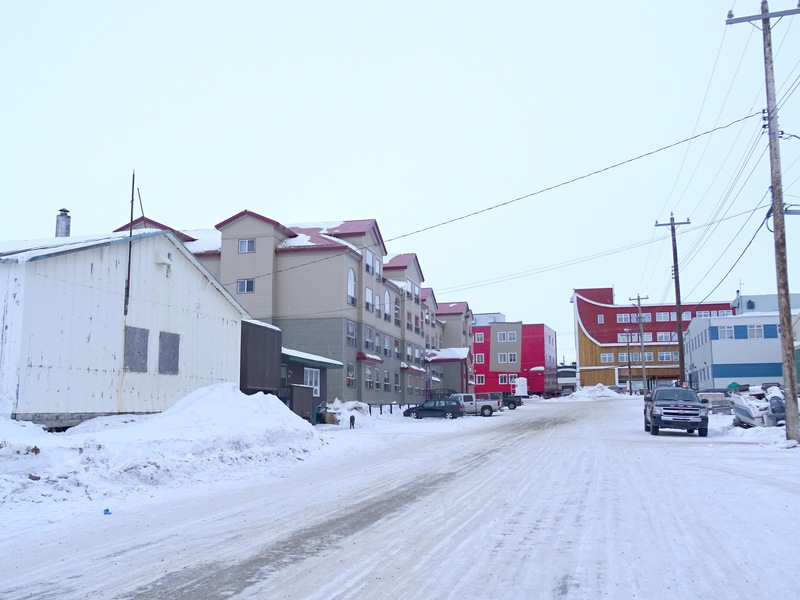 Let’s go on a little tour of downtown Iqaluit, spurred on by what I read in a recent article more about the 1950-era dome-dream for Frobisher Bay, now known as Iqaluit. This shows some of what was designed for the then-community of Frobisher Bay. Well, I am ready to take you to some equally fantastic buildings. But these you can see today in Iqaluit, Nunavut’s capital city whose population is now likely nearing 8,000. 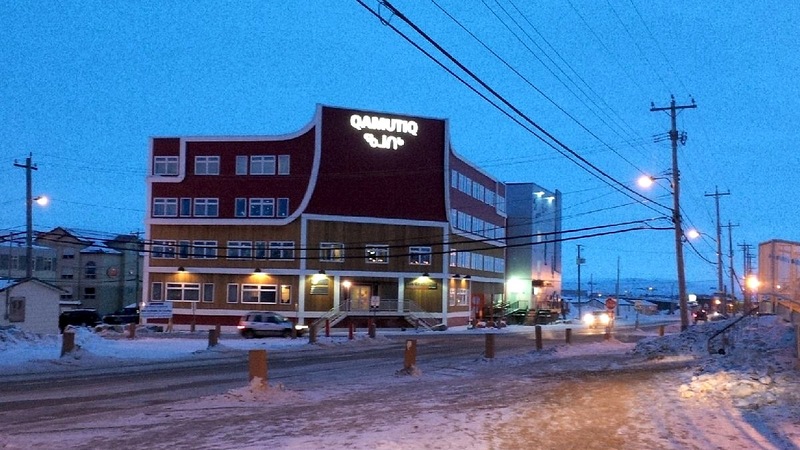 The place to start our tour lies right in the heart of Iqaluit, at the Four Corners crossroads of Queen Elizabeth Way and the Federal Rd. 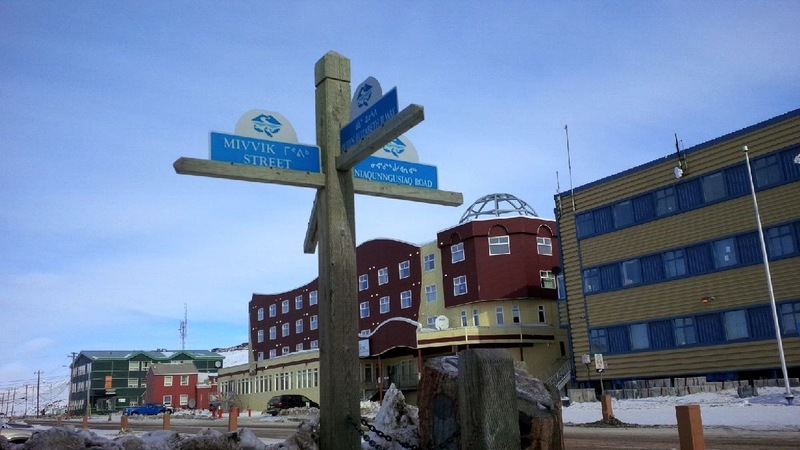 with Mivvik St. and Niaqunngusiaq Rd. 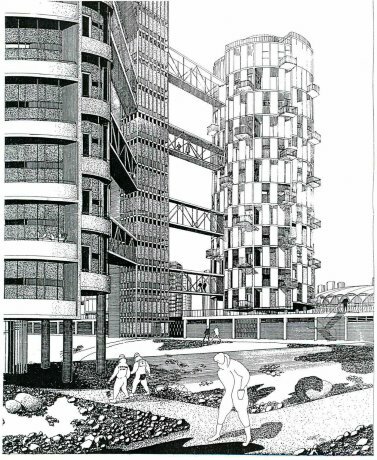 It’s a location which, over the past few years, has morphed into a strikingly unattractive place where southern architects’ fancies, or blunders, are still played out. I can’t help thinking that when the Arctic Council’s top ministers for its eight circumpolar nation members and their entourages pour into Iqaluit at the end of April, they will be whisked from the airport through this — but maybe they can keep their eyes closed and think about climate change. Heads above all those new structures is the Qamutiq building, which an Inuk friend of mine calls “Noah’s Ark” due to its shape. • its shape — why the ultra-high roof? and why red? 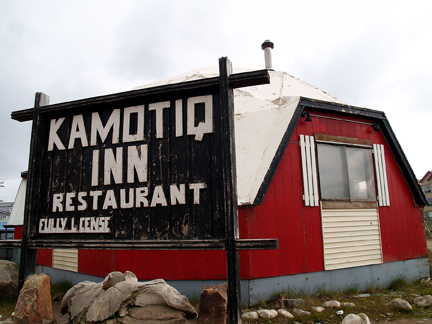 • the location — why not hide this building somewhere instead of putting it in the centre of town where the late domed restaurant, the Kamotiq (also a misspelling), once stood? What’s more, you can see the “Qamutiq” from all over town because of its relatively enormous height. 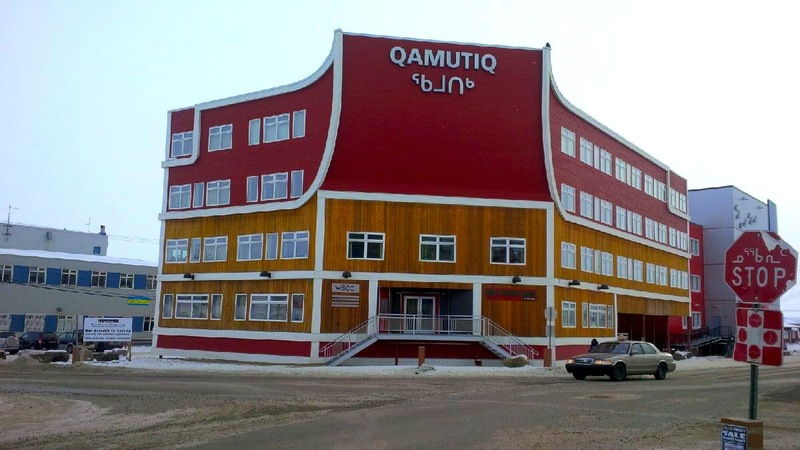 Next door to the Qamutiq stands another brand-new and equally unappealing building called the Qilaut, or drum in Inuktitut, which also features some decorations as well weird multi-coloured wings. Why? That’s all I’d like to know. Kitty-corner to these two buildings lies the nondescript Igluvut building where the T-1 building, which used to house the Nunatsiaq News office, once stood. Here you can’t miss the giant-sized carving, unveiled in 2013 in honour of the 20th anniversary of the proclamation of the Nunavut Land Claims Agreement on July 9, 1993. 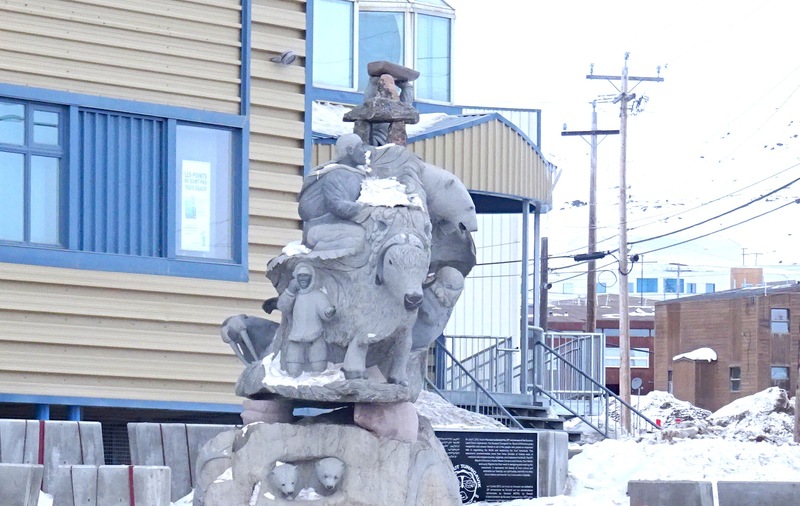 The commissioning this monument, a collaboration of carvers from Nunavut’s three regions — may have seemed like a good idea at the time. But the end result done by three talented carvers, looks like an Arctic nightmare — a mish-mash of every polar animal and symbol of Inuit culture. Nearby stands the Hotel Arctic, featuring colours best described as mustard and ketchup, and a strange igloo-dome appendage on top. Can you tell me what this is? Enough said. Across the street, the low-key, boxy Parnaivik building, whose parking lot lies on the site of Iqaluit’s long-gone mini-golf course. 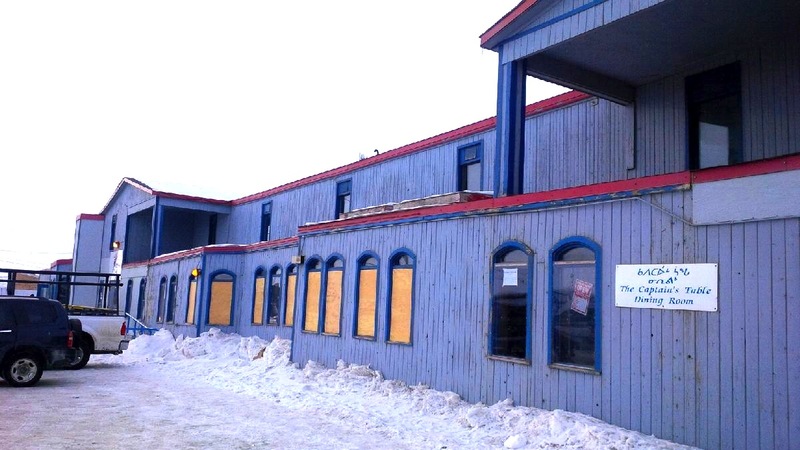 If you head down the street, looking for other sights, you’ll wonder at the boarded-up, but still operating hotel, bar and restaurant, the Navigator Inn. Nearby you can see the Iqaluit of yesterday and today: in the foreground to the right the sole remaining Butler building, former military accomodation from Frobisher Bay’s Cold War beginnings that last served as government staff housing, in the foreground, and, at the end of the street, the Qamutiq. And that’s enough for today’s tour of Iqaluit. 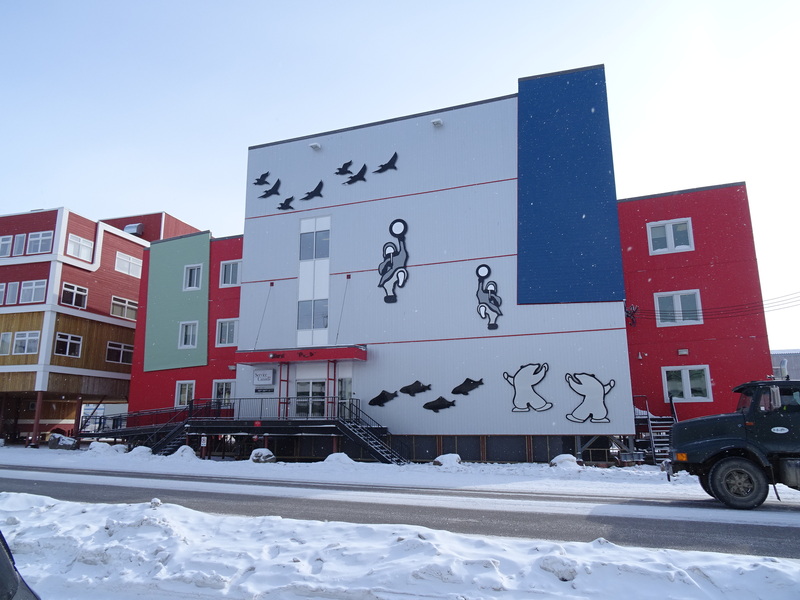 Did you read my first posts about Iqaluit? And are you curious about the Canadian Arctic of the 1990s? You will want to read my “Like an iceberg” series of blog posts. You can find all the links here. Wow – I left in 1989 – only pictured I recognized was the Kamotiq Inn. Actually, I do recognize the Navigator Inn – it was in it’s prime back in 1989.